It is my great joy to speak to you today on the subject of . . . God. Gurumayi has said that Christmas Day is God’s Day. Indeed, it is a moment of the most extraordinary joy when the Lord, God, comes, and reveals his living presence to you. In all traditions, in all countries, in all religions, human beings long to know God, the Supreme Being and mighty power that has created the universe in all its diversity and beauty. In that joy that comes with the revelation of God’s presence, all earthly worries vanish. You know God is with you. And if God is with you, you know everything will be all right. I say this from direct experience. Years ago, when I was young, I wanted to know God so badly. I heard that the Guru can show God to you. So I prayed to the Guru—a deep, heartfelt prayer. I say "heartfelt" because I really meant it, I was a hundred percent sincere. I prayed to the Guru to show me the Truth, and the Guru responded. A great light descended from above, through the crown of my head, and entered my heart. Then this light turned into an infinite column of light whose nature was supreme love. I knew that this column of light was God and that it was the axis of the whole universe and existed in every atom. Having experienced God’s presence and love so palpably, I felt great peace. I remember thinking that if God is in every particle of the universe, then I want to serve God’s world. When we receive shaktipat through the Guru’s grace, we awaken to the experience that God is alive within us at the very core of our being, as our innermost Self. And that God’s nature is light and love. Whenever you feel pure love arising from your heart, know that you are experiencing God. Love is God’s nature, and when we act out of this love, we deepen our awareness of God’s presence. Let God’s love fill your days and nights. In speaking to many Siddha Yogis over the years, I’ve been amazed to hear their stories about how God responds to the pure entreaties of the heart. Each of these stories affirms that God lives in every heart and hears our prayers. Sometimes God manifests as the very longing that arises in our being and calls us to him. A number of years ago there was a young woman, in her early twenties, who was living and working in Los Angeles. She was doing well, yet deep within herself she felt that something was missing and that, without this something, her life was incomplete. So she started praying fervently to God to show her the way. She offered these prayers very privately and sincerely in the space of her own heart. The man smiled and explained that he was telling his friend that he had just gone to a meditation program that day with a meditation Master named Gurumayi Chidvilasananda, and that it was so powerful. The woman asked what he had learned. He said that Gurumayi taught that God dwells in the hearts of all and can be known by turning within. The woman felt moved to go straight home, where she took a seat in her most comfortable chair and prayed to Gurumayi to help her know God. This woman started to repeat the mantra and soon began to relax. At one point she felt what she describes as a gentle breeze of energy wash over her and draw her inside. There she found herself awakening to the most extraordinary sweetness—the sweetness of God within her own being. A sweetness that has never gone away. This woman has stayed on this path of the heart, the Siddha Yoga path, and she now teaches her children that God created this entire world out of his own love and dwells in it, within every being. She teaches her children to live with respect for all. 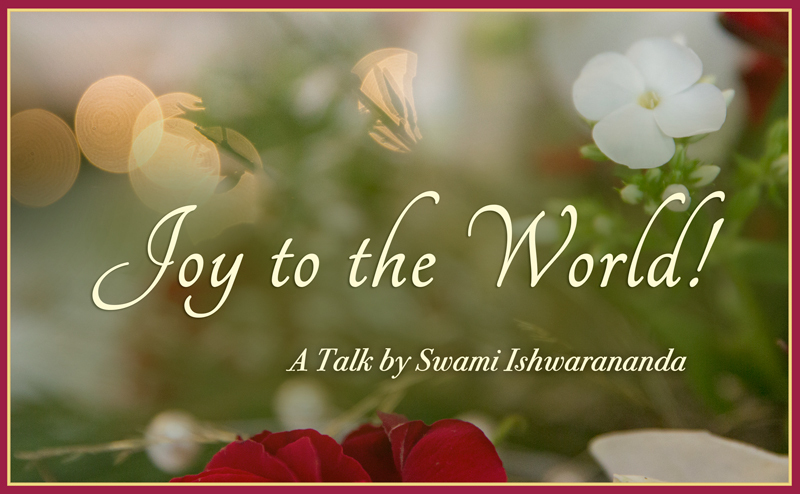 This is Gurumayi’s teaching the woman is following, the goal of the Siddha Yoga path—to live in the awareness of the divinity that lies in ourselves and in all creation. We are so lucky to know and experience this directly. God is alive within us and responds to the prayers and longing of our heart. Therefore, turn to God, speak to God, meditate on God, and chant his name. Today, Christmas Day, is God’s Day. Let us remember that God appears when we invite him to come forth within our heart. You carry God’s light, God’s love. Shower the world with this light! Shower the world with this love! I have been remembering how my search for God began as a young child. I pondered the question Who is God? over and over in my mind; unable to find a satisfactory answer, I asked my mom. She replied, “God is the real you, who lives in your heart.” Yes, this is it! God is truth, honesty, all the wonder in my heart. The light of God dwells within me. This understanding has guided my life. I am grateful for this beautiful reminder of who I truly am. I am so grateful to have read this talk! It reminded me of an experience I had in response to my own deep longing, my fervent wish, to feel connected to God and to the people and creatures around me. One day I was standing on a busy New York City street corner. As I was releasing an empty coffee cup into the trash bin, I looked up and saw that the world was moving more slowly. I was aware of every person all around me! Then I heard, deep in my heart, “Love is all around you; see?” And yes, I could see it—shining from every face, flowing as light around every movement of people, cars, buses, bikes. My heart opened wide and the enormous love that I had always felt within was revealed as every being around me. It was very inspirational for me to read this talk. I felt more willing to turn within and be like the two people whose stories were shared in it. And somehow I felt that I already know the feelings described there: through the unfolding of my sadhana and my commitment to the practices, I do know what it is to have God inside. I am very grateful for this reminder of the importance of talking to and connecting with God. This talk reinforces for me the wisdom of approaching God with a full and open heart. How wonderful it was to read these words and to learn the story of the young woman who was drawn to the experience of God in the heart! I feel that we are all connected, and this could be the story of many of us who come to this spiritual path in a miraculous way. Thank you very much, Gurumayi, for giving me the experience of this loving inner space and teaching me how to honor it. I am blessed.